The Society’s executive director has been attending the annual conference of the American Association for State and Local History (AASLH) for many years. It was one of the first things that I did when I began working here in 2008, traveling to Rochester, New York, with former executive director Angela Bergman. On that trip, we sat on the actual bus that Rosa Parks rode in — you may recall that we awarded the Dorothy Comstock Riley Legal History Award in memory of Mrs. Parks in 2006. Read more about that here. 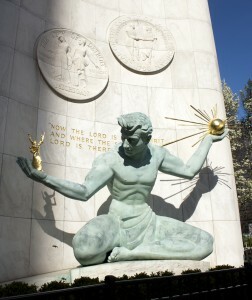 This year, the national conference’s location is Detroit! This means that more representatives of the Society’s Board of Directors will be able to take part, joining me in sessions this evening and on Friday. I will return to our office on Monday, September 19th — just in time to prepare for the State Bar’s Annual Meeting in Grand Rapids where we will be an exhibitor. I hope to see you on my travels!